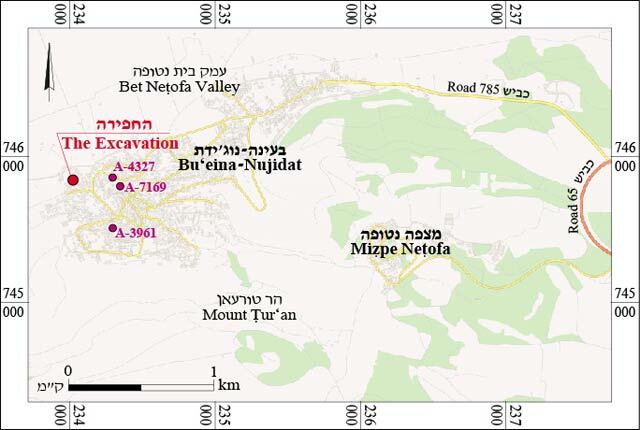 In February 2016, a trial excavation was conducted in the northwestern part of Bu‘eina-Nujidat in Lower Galilee (Permit No. A-7632; map ref. 234025/745845; Fig. 1), after ancient remains were exposed in trial trenches opened prior to construction of a house. The excavation, on behalf of the Antiquities Authority, was directed by A. Efron (photography), with the assistance of E.J. Stern (scientific guidance), Y. Ya‘aqobi (administration), R. Mishayev and R. Liran (surveying and drafting), Y. Alexandre (pottery), H. Tahan-Rosen (pottery drawing) and A. Shapiro (map). The fieldwork was conducted by members of the Hammudi family from Bu‘eina-Nujidat. Kafr Bu‘eina was first mentioned during the third century BCE as a wine-producing estate (Tsafrir, Di Segni and Green 1994:80, Map 4). Conder and Kitchener documented in the village a built tomb from either the Roman or the Byzantine period, a rock-cut installation, a built reservoir and an ancient church rebuilt as a mosque (Conder and Kitchener 1881:362, 381, Map: Sheet VI). 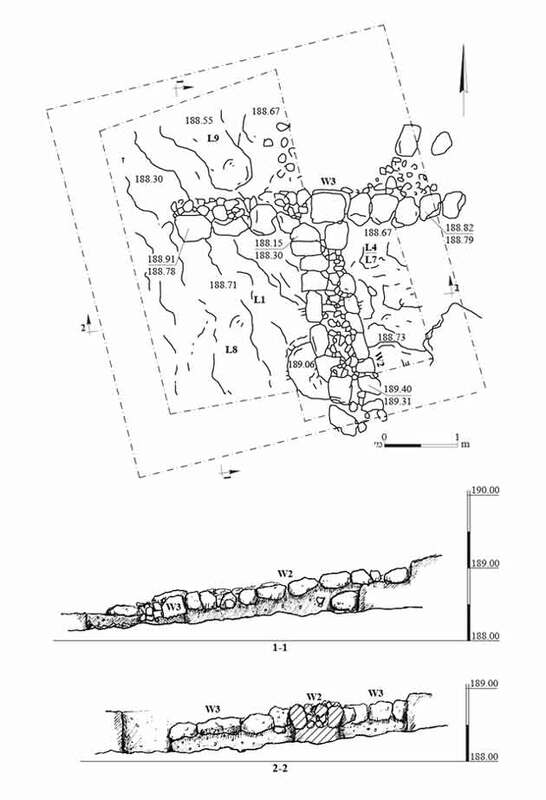 Excavations conducted at the site in 2003 and 2004 revealed meager remains of rock-cut installations, quarries, terrace walls and a cave used for dwelling (Dalali-Amos 2006 [Fig 1: A-4327]; Porat 2007 [Fig. 1: A-3961]). 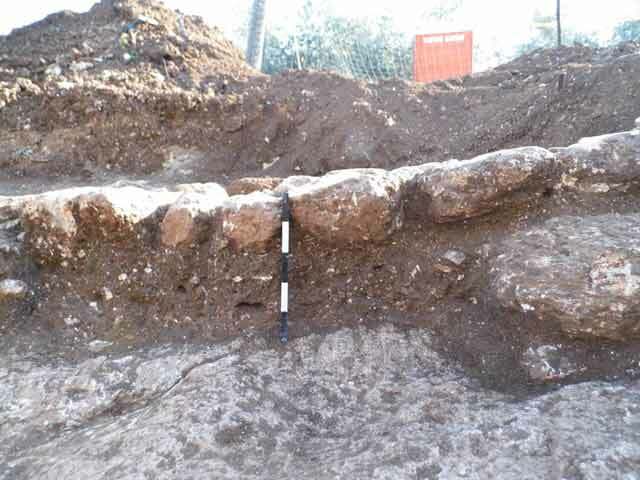 An excavation conducted in the ancient nucleus of the village in 2014 revealed fragmentary architectural remains from the Early Roman period, or possibly the late Hellenistic period, and the transitional Late Roman–Early Byzantine periods, as well as sporadic sherds from the Early Islamic and Mamluk–Ottoman periods (Alexandre 2016 [Fig 1: A-7169]). 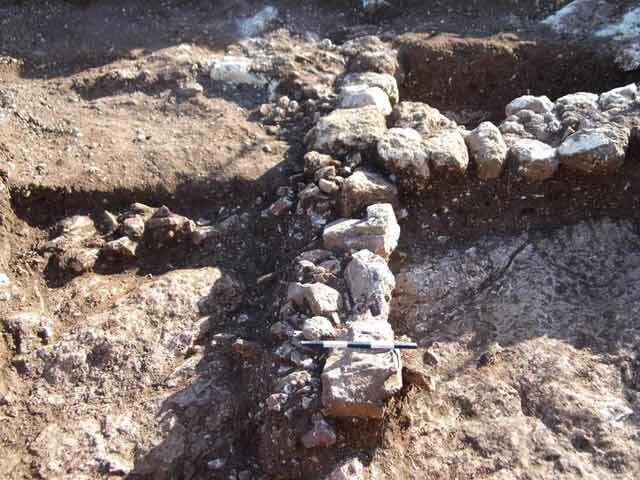 One excavation square (25 sq m; Fig. 2) was opened in the courtyard of the modern house, on the lower part of the northern slope of Mount Tur‘an. 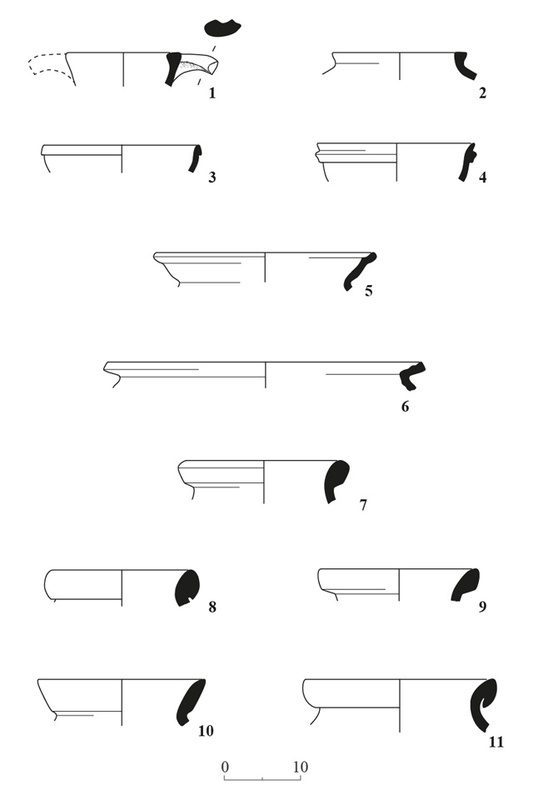 Remains of two walls of a building were exposed (W2, W3; Fig. 3) below the topsoil layer (thickness 0.5 m). Wall 2 (length 3 m, width 0.7 m) abuts W3 (length 4 m, width 1.2 m) on the south; most of the northern part of W3 was not preserved. The walls were built on a thin layer (thickness 0.2–0.5 m) of soil above the bedrock (Figs. 4, 5) and comprise two rows of large- and medium-sized fieldstones with a fill of smaller fieldstones between them; they were preserved to the height of one course. Since no floor was found, Walls 2 and 3 may have served as foundations, and their superstructure was not preserved. 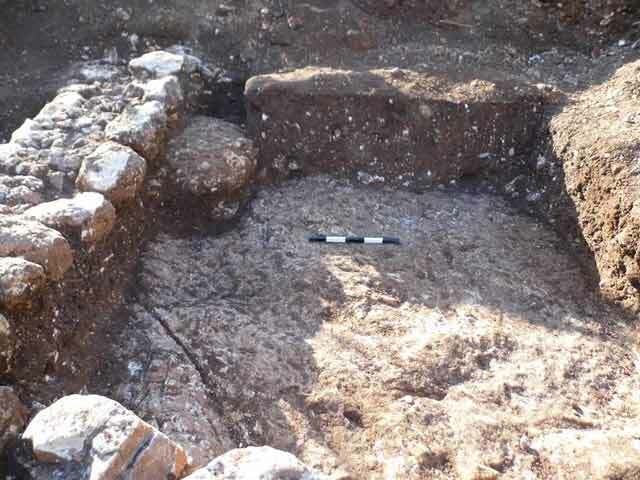 The layers of soil associated with the building remains (L1, L4) and below them (L8) revealed potsherds dating from the late Hellenistic and the Early Roman periods, includingHellenistic cooking vessels (Fig 6:1, 2) and Early Roman cooking pots (Fig. 6:3–6) and storage jars (Fig. 6:7–11). One cooking pot is a Kefar Hananya Type 4A (Fig. 6:6; L8); one storage jar is a bag-shaped storage jar with a tapered neck (Fig. 6:10). Alexandre Y. 2016. Bu‘eina-Nujidat. HA-ESI 128. Dalali-Amos E. 2006. Bu’eina. HA-ESI 118. Porat L. 2007. Bu’eina. HA-ESI 119. Tsafrir Y., Di Segni L. and Green J. 1994. Tabula Imperii Romani; Judaea-Palaestina: Eretz Israel in the Hellenistic, Roman and Byzantine Periods: Maps and Gazetteer. Jerusalem. 3. Walls 2 and 3, looking east. 4. Wall 2 and the bedrock, looking south. 5. Wall 2, looking east.